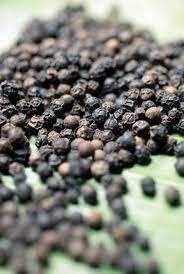 Black Pepper (Kali Mirch) is one of the oldest and most important of all spices. It is usually dried (known as peppercorn when dried) and used as a spice and seasoning. Black pepper is useful in relieving flatulence. Pepper has a stimulating effect on the digestive organs and produces an increased flow of saliva and gastric juices. Alternatively, a quarter teaspoon of pepper powder mixed in thin buttermilk can be taken during indigestion or heaviness in the stomach. For better results, an equal part of cumin (jeera) powder may also be added to the buttermilk. Three peppers sucked with a pinch of cumin (jeera) seeds and a crystal of common salt provides relief from cough.